We all have them in the back of our minds; those moments that make us think "man, this is what the movies are all about". We relive those moments in our mind's eye, remembering them and dissecting them and adoring them. They come in all shapes and sizes, from all types of films, and yet they all share one very important aspect; they define why we love the movies. It could be the way that the moment is cut; the way it's edited together. It could be the way the moment uses it's actors to evoke a powerful emotion from us. It could be the way that music floods the scene and draws us even closer to the moment in question. It could be a grand climax, a breathtaking introduction or a simple interchange. It could be any and all things, because for every film lover, the list is different. At first I thought I'd start by skipping the most famous, obvious examples—the opening of Citizen Kane, for instance—but then I found so many well-received movies in my own list that I couldn't resist including them. I'm also going to go ahead and mention these scene descriptions almost always contain spoilers—there's just no way around it. I'll vaguely sort them from more subtle to more bold. So to continue to the spoiler-riddled list, please continue reading. Flattened by a long zoom lens, Harold stands pensively looking out a large picture window. The reflection of the world in the glass suddenly warps as the door to the room he's in swings open. A doctor enters and says a few words and Harold's head sinks. Maude is dead. Until I wrote this, I never put together just how prescient the distortion of the reflection is in predicting the destruction of Harold's world. It's like the flash of an atomic bomb. I love its use in the scene. Mr. Hulot is dining beside a stranger in the dining hall of the hotel. Just as the man is about to dab his mouth with his napkin, Hulot cautiously reaches for the salt on the far side of his new partner. In doing so, he rubs his sleeve against the man's face, wiping his lips clean; likewise on the return trip. After an indignant look, he is about to use his napkin again but pauses, and anticipating Hulot's need, he moves the creamer to his right, thinking he has solved the problem. But just as he is about to dab his lips, Hulot nods politely at the gesture and again reaches across—this time to return the salt, and once again wiping the man's face twice. Jacques Tati is a master of physical comedy and all his work is still funny, but this one scene still makes me laugh out loud. Perhaps it's the casual irritation of the man next to him—his facial expressions are absolutely perfect—or maybe it's just the entire concept and how oblivious behavior remains just as impolite 62 years later. Veronika is on a bus to see her man for the last time before he goes off to war. The bus stops and she rushes to get off. She begins searching, passing behind traffic and finally runs between two rows of oncoming tanks. The camera—having followed her continuously from the bus and onto the platform—suddenly rises high above the crowd. I have no idea how this was done. But the effect of suddenly flying into the air was amazing punctuation for the scene. 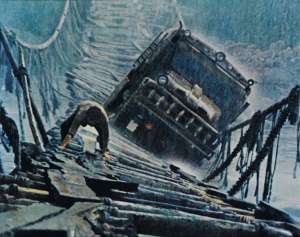 If a viewer were immersed in the pragmatism of the scene, watching the mechanics of exiting the bus, there is no way jee could continue once the camera went flying upward. It's a brilliant scene made from one amazing shot. Jerry Lundegaard's plan is falling apart as he's in the midst of its execution. He finds the car he's looking far parked atop a desolate garage. The film is set in a freezing winter in the northern middle-U.S., so as would be expected, the ground exposed rooftop lot is covered in snow and the car covered in a layer of ice. William H. Macy plays the scene impeccably—Lundegaard is well-versed in the procedure and begins scraping at the windshield ice. Unfortunately, it's like minus zero Fahrenheit and the ice is rock-hard—the kind of ice that us northerners know well and hate the most. The stone-on-stone scraping sound reverberates with the deep vibrations of the windshield as Lundegaard impotently produces puffs of icy dust, as if the world itself were conspiring against him. His tenuous facade finally cracks and he limply wields the plastic scraper as a hammer and bangs it on the windshield repeatedly until it flies from his loose grip, continuing his frustrated flailings to the starkly empty lot. I love how this scene so efficiently conveys Lundegaard's breakdown. I've been frustrated and found my car iced in like this too, and reacted almost the same way, so the scene resonates with me very well. And it's the only time I have seen the use of an ice scraper in a film—especially as such a pivotal tool in the scene. Frank Bullitt is driving his green Ford Mustang fastback when he spots two men who are tailing him in a Dodge Charger. He manages to lose them and they continue their search. The driver is scanning the road when Bullitt's Mustang appears over the horizon in the rearview mirror. The camera zooms in on it, then the driver notices and is moderately shocked. A few blocks pass, then the Charger stops for just a moment. The driver reaches down and buckles his seatbelt. This marks the start of the most famous, possibly best chase scene ever put to film. Again I love the efficiency of explanation: seatbelts. That's how you knew things were going to get fast in 1968. And Bullitt's car appearing in the mirror is just brilliant and expertly handled. As one of two desperate groups of men tries to move unstable explosives across a South American country, one group attempts to cross a rocky river on a woefully inadequate bridge made of rotting ropes and broken planks. A fierce rainstorm pitches the bridge and truck back and forth as one of the men goes ahead on foot to direct the driver's actions across the most stable of the boards. Inch by inch, the lumbering steel giant crunches and cracks its way across. There are two things that I love about this scene. The first is, like the scene in The Cranes are Flying, I have no idea how it was done (until reading the Wikipedia account). It looks like it was really happening—a testament to professional filmmaking. The second is, it's an incredibly tense and terrifying scene, yet it didn't come off as campy or false. Since the characters are not pivotal to the uncaring plot, they exist in actual peril. As Harold and Maude sit in a field of daisies, Maude asks Harold, "what flower would you like to be?" He says, "I don't know. One of these, maybe. […] because they're all alike." Maude explains how much different each one is from each other the adds, "You see, Harold, I feel that much of the world's sorrow comes from people who are this"—as she refers to the single unique daisy—"yet allow themselves be treated as that", gesturing to the whole field. No sooner does she finish her line that the film cuts to a tight shot of the duo sitting in a cemetery beside a few orderly gravestones. The camera begins zooming out and it's clear they are in Arlington Cemetery. The the camera keeps zooming out until Harold and Maude are but indistinct figures in the corner of the screen filled with the tombstones alternating with grass to create a Moiré-pattern. I get chilled and tear-up a little even thinking about how the camera starts to zoom out and you think you get it, but it just keeps zooming out farther and farther until the gravestones are like the "identical" daisies. It's so—I have no words for it. Just metaphor as an unassailable truth laid out in 30 seconds of film. This entry was posted in Blog Entries, For the Parents, Movies and tagged Bullitt, Citizen Kane, Fargo, Fistful of Films, Harold and Maude, Jacques Tati, Jenn, Letyat Zhuravli, Monsieur Hulot, Mr. Hulot's Holiday, Sorcerer, The Cranes are Flying, William H. Macy by Jason Olshefsky. Bookmark the permalink. I'm so glad you stumbled across my blog and found the time to play along, and I'm so pleased to see mentions for a slew of films that no one else has mentioned…especially The Cranes are Flying, which is one of my favorite films…and that scene is so beautiful! It was a great idea … I'm liking the vague "blogging community" stuff—especially when I can get involved. The scene in Fargo was the first one I thought of, actually. It really sticks in my brain. Wow, so many classics in here. Dang it, I think I should've watched Ivan's Childhood sooner. Thanks—going through your list now!